There are so many men's watches on the market today. We understand how easy it is for indecision to strike when trying to choose the one of the best men's watches. That's why we want to help ease the process. Having the right watch on your travels can make all the difference. With tech ranging from a compass, barometer, fitness apps, and a personal assistant, the options are nearly endless. Since you can't always whip your laptop out and sometimes your phone runs out of juice, these watches offer a convenient way to stay organized and stylish on the go. If you need a starting place, then it will help you to begin by considering a couple of questions. 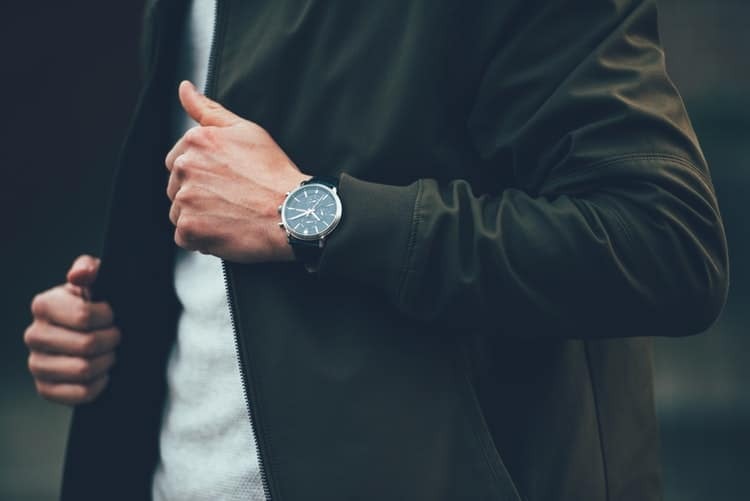 When looking for the best men's watches, here are some questions to ask yourself. They will point you in the right direction. Knowing your budget will be key to finding the right one among the best men's watches. Whether you are looking for a small style or something a little more in the luxury department, knowing your budget will help narrow down your options. We suggest approaching this guide with a price limit in mind. There are a lot of brands out there with affordable styles. 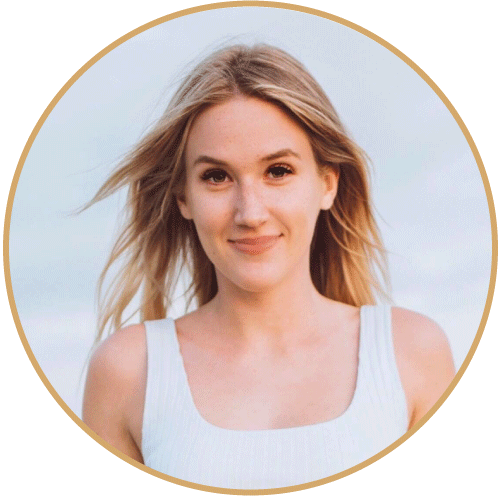 That way, you will be able to knock off all the items that are out of your price range much faster and, subsequently, locate your perfect watch that much faster. Believe it or not, you'll find some of the best men's watches under $100. What Do You Already Own? There is no sense in purchasing items that are similar to what you already own. Make sure what you're investing in really serves its purpose well. This just goes to show you don’t need to break the bank to score on a luxury. 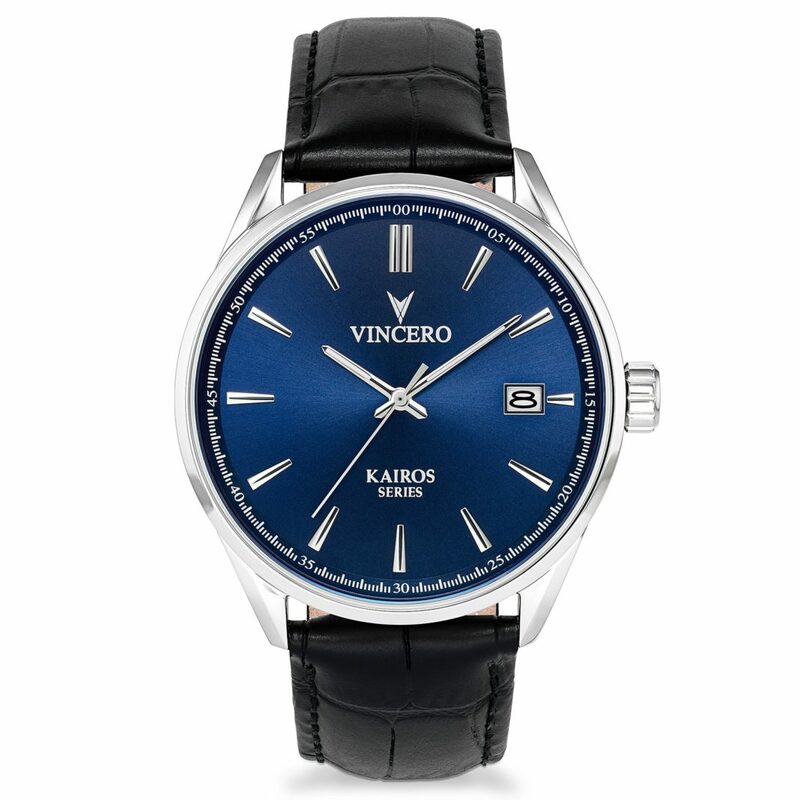 Vincero crafts luxury watches for the modern man but they are so much more than simply watchmakers. At the core of their belief is that you deserve the best quality product you can to look and feel at the top of your game. We all know that when you look good, you feel good, and when you feel good, you can do anything. 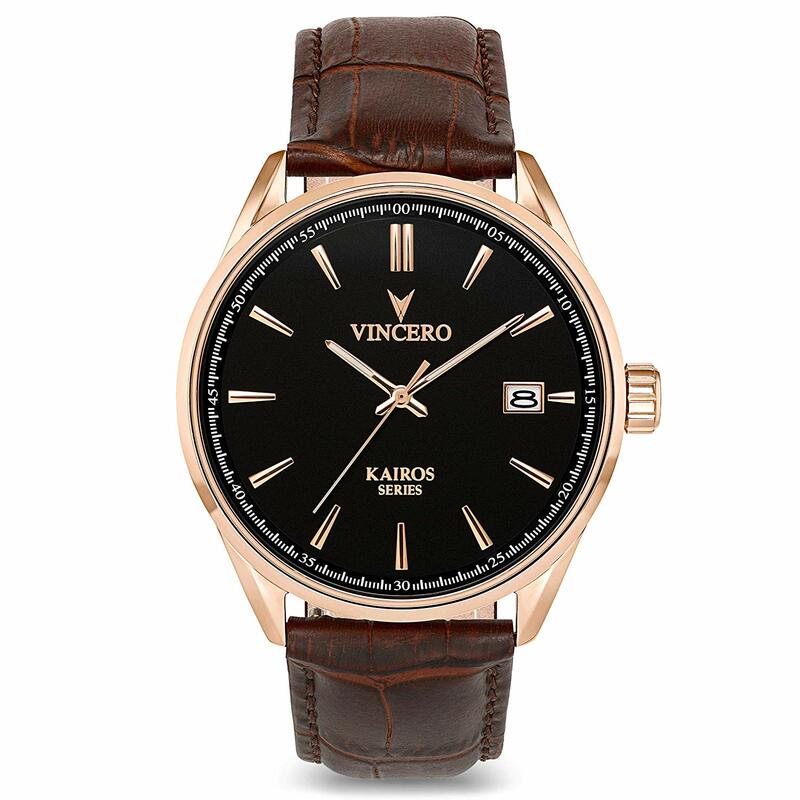 Vincero’s Kairos is one of the best men’s watches. Engraved on the back of the watch (and all the Kairos styles) is the motto “Live your legacy.” This is a great reminder to never stop or settle. Endlessly pursue your goals. Every single caseback features gorgeous historic Italian marble. As the saying goes, Rome wasn’t built in a day. Nothing worthwhile is. This timeless wrist piece is a reminder of persistence. Vincero’s obsessive goal is to create pieces that match your hustle. And they definitely do just that. This watch certainly has a distinctive look and quality. You can feel it. For the folks at Vincero, luxury and quality are about so much more than prices or mere specs. It’s all about value. It’s also about attention to detail. They never take shortcuts and commit to always providing customers with nothing but the best. This Italian leather band is made to last. It measures 22mm wide and is interchangeable. To switch it out, just use the button on the back. Surgical grade stainless steel contributes to a strong body. The 43mm diameter is great for both casual and formal settings. We love this style from SKMEI. An outdoor sport and casual fashion brand, SKMEI is committed to providing the best products, the best service. 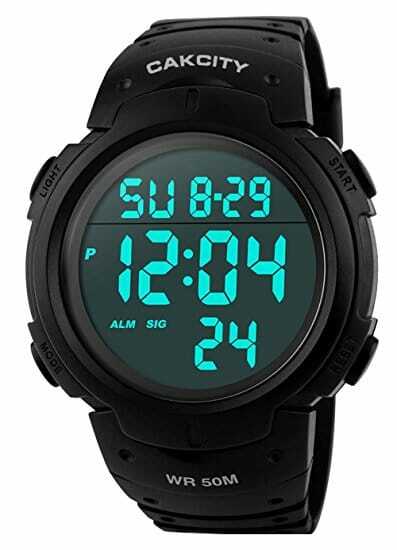 This fashionable digital display led wrist watch offers high precision and elegant appearance. This watch is very durable and supports long time using. This is one of the best men’s watches. Taking a look at the features, the compass function is prepared for outdoor adventure enthusiasts. There are so many great features on this digital sports watch for travelers. An altimeter, pedometer, and memory storage come together for optimal use. At your location, when the air pressure rises, the weather maybe fine; the air pressure drops and the weather would be cloudy and rainy. With temperature display, user can preview the weather out of door. The pedometer tracks your moving steps, you will know how far you walk and how long between you and destination. The memory storage records the last 7 days data in the watch and the sequence of screen display is in step of distance, calories, sports time. Say hello to one of the best men’s watches on the market. This digital sports style is both stylish and practical. A military outlook gives way to features like a large dial, light up numbers, and a shock resistant exterior. 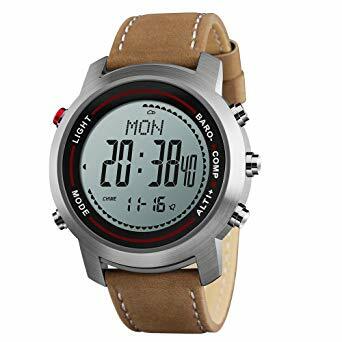 Built for those who love an active lifestyle and exploring the great outdoors, it also offers a stopwatch, 24 hour military time, and LED light back functions, perfect for all kinds of sports and daily use. Last but certainly not least, it is water resistant for up to 164 feet. 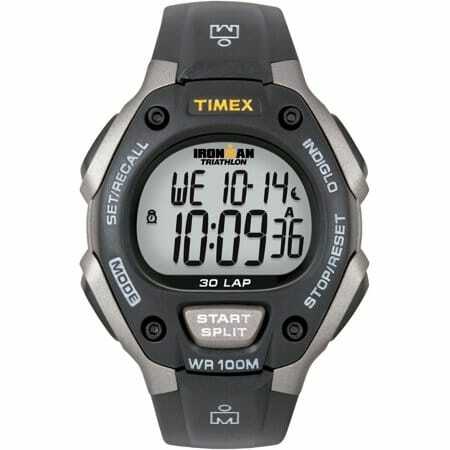 The Timex Ironman Classic 30 Full-Size Watch is an undisputed favorite in the world of sport watches. The first Timex Ironman watches came around in 1986. The Ironman Classic 30 builds on the legacy of the brand’s heritage. Think of it as your dependable companion for your morning runs, laps in the pool, the job site, and the office. This watch is simply amazing. The occasion mode lets you set up to 15 reminders for events including birthdays, anniversaries, holidays, appointments. In the meantime, the handy alarm mode gives you three individually customized settings with daily, weekday, weekend, and weekly options. Travel regularly and your Ironman Classic 30 can be set with up to three time zones. Several on-screen prompts make it really easy to set up your watch. The pusher located on the watch face is easy to access while you are active. 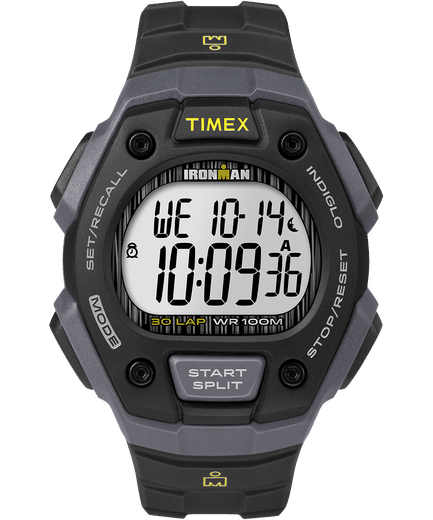 Each Timex Ironman Classic 30 is equipped with Indiglo night-light, a low-powered electroluminescence, providing easy readability in the dark. The Night-Mode feature enables to you activate Indiglo with any button simplifying operability in the dark. It's so lightweight, you'll forget you were wearing it. All styles are water-resistant up to 100 meters (330 feet). It comes in a bold array of colors so you don't have to sacrifice fashion for function. 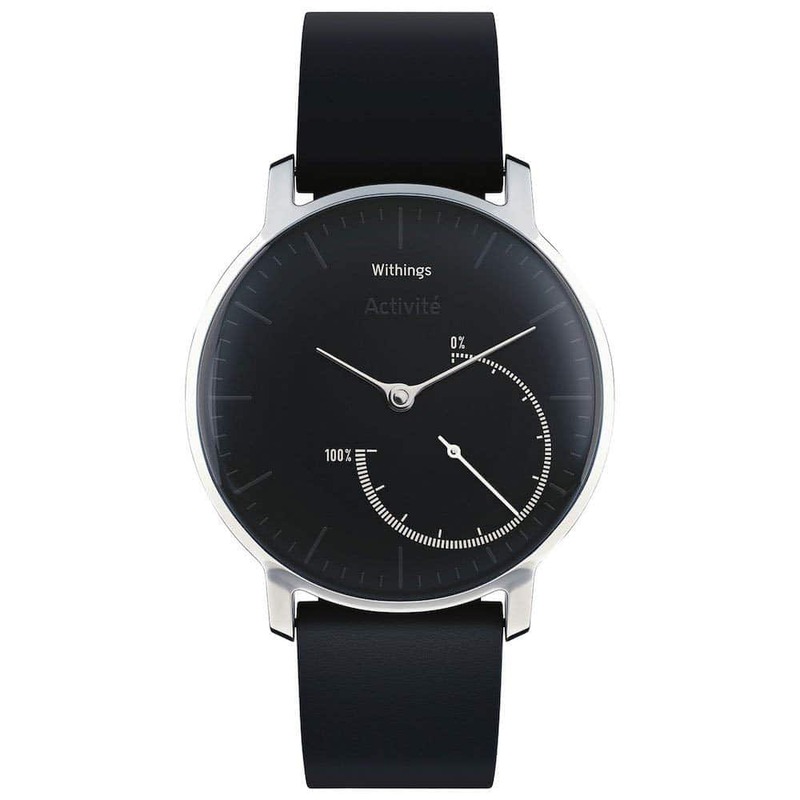 Techcrunch calls this watch the “best overall activity tracker.” This watch is styled for life and built for health. It automatically tracks all of your activity (steps, runs, swims, distance walked, and calories burned. Want to know the best part? There’s no charging needed and no button to press. With a sleek design and stainless steel finish, it’s the perfect accessory to help get you moving without sacrificing style. Track your activity at a glance. This is where the “no button pressing” part comes into play. A tachometer-inspired sub-dial tracks progress towards your daily goal. Activité Steel automatically detects and tracks all activity, including walks, runs, swims, and sleep. Set your personal goal in the Health Mate app. We particularly love that the activité Steel is water-resistant up to 5 ATM (50 meters - 150 feet). Steel automatically detects swimming, so you can track and analyze your water workouts in the Health Mate app. It gets even better. The Activité Steel also automatically detects sleep, and recognizes sleep patterns including light and deep sleep cycles, sleep interruptions, and the total duration of sleep. Set a silent alarm in the app to start your day with a gentle wake-up vibration. There’s no need for charging cables or a dock. The Activité Steel operates on a standard button cell watch battery to provide up to 8 months of battery life. No charging means you never miss a step. The Activité Steel syncs automatically with your phone so that you can track all progress and view graphs in the free Health Mate app. The app offers expert coaching every step of the way with activity insights, a leaderboard, and reminders to help you reach your goals. A full MyFitnessPal integration combines food logging and activity tracking to help balance calories (intake and burned). Health Mate is also compatible with over 100 top health and fitness apps such as MapMyRun, Nike+, Apple Health and many others. Looking beyond technology, Steel's state-of-the-art finish boasts a 316L stainless steel case, chrome hands and a soft silicone sport strap. Its sleek design make it the perfect accessory to help unlock your potential, without compromising on style. Tracks your steps taken, calories burned, etc. We hope you enjoyed reading our feature on the best men’s watches of 2018. As you can see, there are plenty of stylish, practical styles on the market that won’t break the bank. These styles offer great features for travelers, businessmen on the go, and fashion lovers.